Three bedroom, detached house (including a connected, but separate 1 bedroom flat with own kitchen/living space). 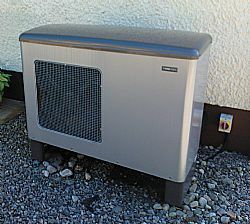 A NIBE 11kW air source heat pump with a water tank which allows for a backup heating system. 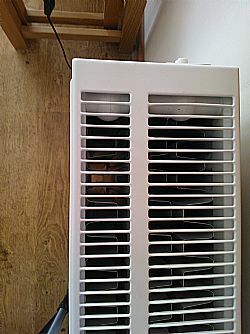 An air source heat pump works by taking the latent heat in the air (even as low as -15°C) and transferring it to a fluid with a low boiling point. 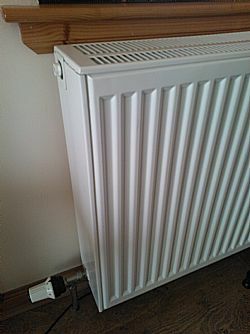 The fluid is then compressed, which further raises its temperature, and pumped around the household radiators for space heating and through a coil in a water tank to provide domestic hot water. Originally the owners kept their oil heating as a back-up so the water tank has multiple coils for heating via different methods, however this has since been removed as it was not needed. £10,500 including new triple radiators (right) and a new water tank to accommodate different heating systems. The Energy Saving Trust interest free loan of £10,000 and a Renewable Heat Premium Payment (RHPP) of £850. The property will also be eligible for the Renewable Heat Incentive as of July 2014 which will provide approximately £750 per year for seven years (£5250 in total) after the RHPP payment has been debucted. The system will never fully “pay for itself” as the heating costs of the house are fairly similar to pre-installation, however the oil boiler was only ever on for 7 hours of a day whereas the ASHP keeps the house at 22 degrees for 24 hours (17 degrees overnight). No planning issues but the owner did have to pay to have the mains electricity transformer upgraded as the extra demand for electricity was considered more than the system could handle. Installation took only a few days and the biggest inconvenience was that the new water tank was slightly larger so an internal wall to a cupboard had to be removed for extra space. 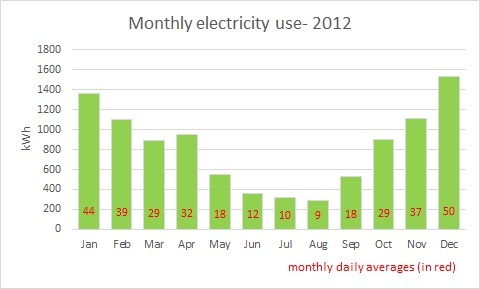 The heat pump does require electricity to run (see below) and has an annual service which costs around £120. 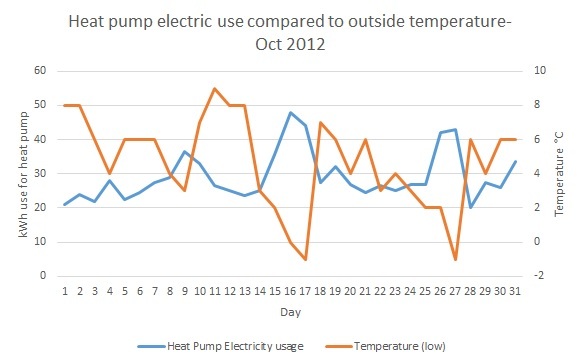 The graph below shows how the heat pump responds to outside temperatures with the electricity use going up the colder it is outside. The owners were concerned about the rising costs of oil and the fact that they were due to retire and would be at home more often (requiring the heating to be on more). When they were building the property they had investigated different heating types and had considered ground source heat pumps- although this proved too costly at the time they decided to revisit the renewable heating options. Eventually they settled on Renewables Now to install the ASHP system and are extremely pleased with it. The house is warm 24 hours a day (which they couldn’t have afforded to do with the oil heating), they have found the technology easy to understand and the levels of support from the installers extremely helpful. So they could fully understand the costs of the technology they installed an OWL monitor to track its energy use and have kept records of daily temperatures to check the pumps response.